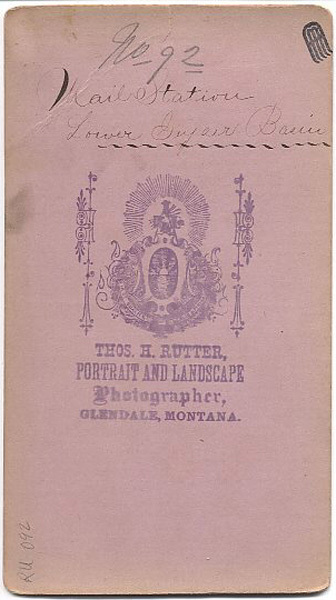 Thomas H. Rutter and his partner for a time, James Nesbitt, are known to Montana historians as photographers at Butte, Glendale, and Deer Lodge, Montana, but their Yellowstone views are less well known. Rutter's outsized stereo views state on them that he was "established 1870" but where is not known. By 1879, he was located at Deer Lodge, and it is known that he visited Yellowstone Park that year. 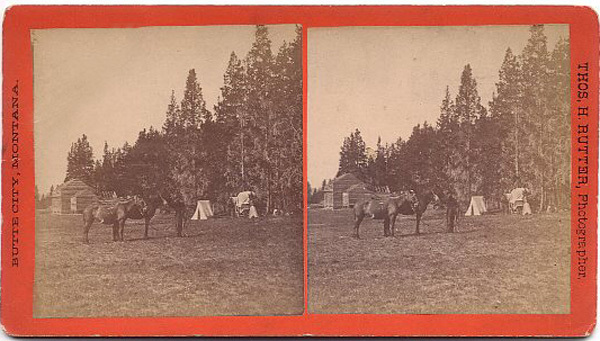 Hence it is likely that some if not all of his Yellowstone photos date from 1879. 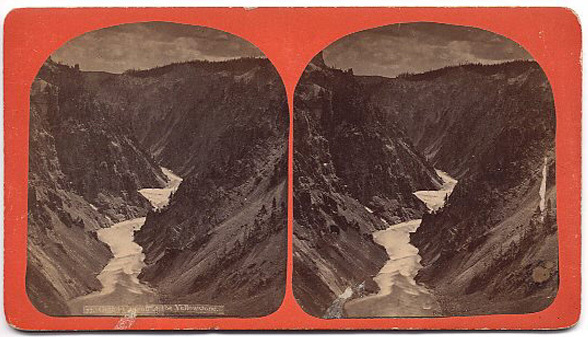 His Yellowstone stereoviews come in several styles. Those credited to Rutter & Nesbitt, Glendale, MT are the earliest, dating from 1880-1882. In 1883 Rutter began producing his Butte City Mounts. Many of these have an elaborate viewlist on the reverse side of the view. 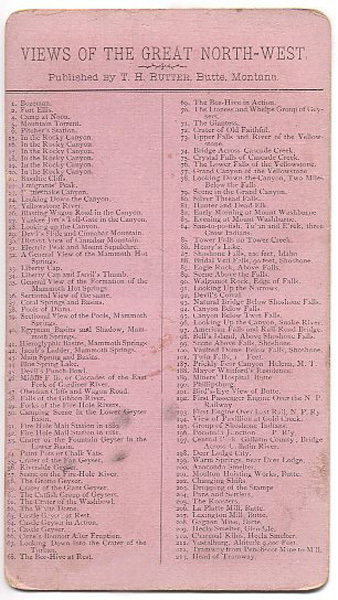 If we are to believe the numbering from this list, he marketed nearly one hundred views of the park. In 1889, Rutter left Montana and moved to Tacoma, Washington where he continued to photograph. Some of the most important early photos of the Tacoma area are credited to him. From 1900-1905 Rutter was listed in Yakima, Washington. By 1909 Rutter’s health began to decline and he lived out his days in various soldier’s and veteran’s homes in Washington state. He died in 1925 at the age of 88. Untitled View of Castle Geyser. 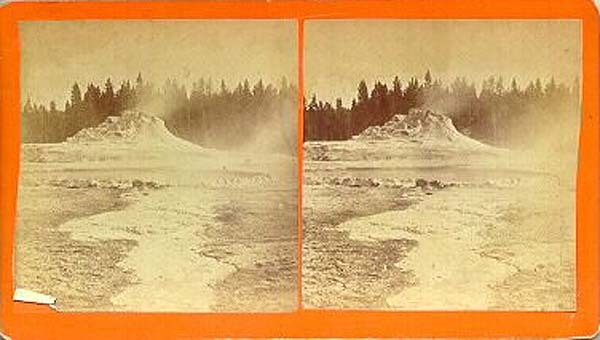 This view of Castle Geyser is one of the earlier Rutter views. The verso credits Rutter & Nesbitt and lists studios in Glendale, Montana. An extremely rare view of the tented mail station at Lower Geyser Basin. In the background is the only known photo of the 1st Marshall Hotel under construction. 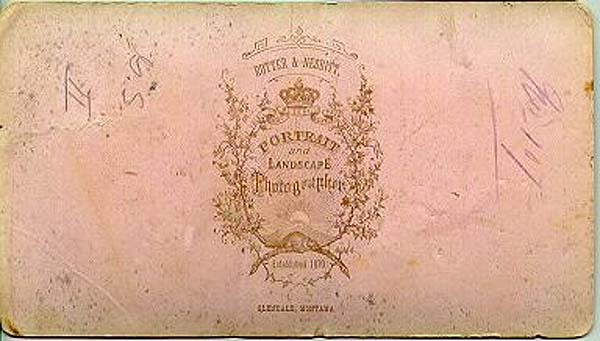 This is a later image than the one above and credits only Rutter (no Nesbitt) out of Butte City on the obverse and Glendale on the reverse. 77. Grand Canyon of the Yellowstone. The most common Rutter views (if there is such a thing) are these orange mounts with the detailed viewlist on the reverse. Any Rutter view is very rare and highly sought after by collectors.